Sri Lanka’s Cultural Triangle, crowded with ancient sites, has become an increasingly popular nature and adventure holiday destination in recent years, too. There are several sanctuaries such as Ritigala and Rasvehera in Sri Lanka’s historic heartland, Hurulla Eco Park is situated halfway between Anuradhapura and Polonnaruwa and close to Sigiriya and Dambulla. And Polonnaruwa District is crowded with national parks along the Mahaweli River. Two national parks, Minneriya and Kaudulla not far from Habarana in the centre of the Cultural Triangle, are exceptional highlights for travellers in Sri Lanka’s North-Central Province who like to experience an elephant safari, offering a welcome change an a classic cultural tour. Nowhere else in the world can be seen more Asian elephants at one place than in Minneriya National Park, which is easy to reach from all major heritage destinations and hotel clusters in the Cultural Triangle. The centrepiece of the park is the large Minneriya Wewa, a reservoir created by the famous King Mahasena in the 3rd century A.D. During the local dry season from May till October, the Minneriya tank attract literally hundreds of wild elephants, an amazing annual event that is now known as “Elephant Gathering”. Particularly in August and early September, the Minneriya area is inhabited by about 700 elephants. Eevery afternoon up to 300 of them come together in the grasslands at the western banks of Lake Minneriya. At least 100 jumbos at once are guaranteed on Minneriya safaris during the northern summer months. Jeeps can come incredibly close to this huge seasonal herd, but they should always keep a few dozen meters distance to the wild trunked animals, in order to prevent accidents and too much disturbance. The main gate of the national park is close to both the railway station and the A11 main road, which is used for travelling from Anuradhapura or Sigiriya to Polonnaruwa. Minneriya Railway station is on the Colombo-Polonnaruwa railroad via Polonnaruwa. Minneriya National Park, covering an area of about 90 square kilometers, lies in the north-central plains of Sri Lanka. The park is situated in Higurakgoda Divisional secretariat. At the eastern border of Polonnaruwa Disrict. The park is situated at the western side of Lake Minneriya, which is an ancient tank that was renovated in the 19th century and irrigates the considerable area of Polonnaruwa District. The major city closest to Minneriya National Park is Polonnaruwa. But a major tourist hotspot even closer to Minneriya is the Sigiriya-Dambulla area in neighbouring Matale District. Minneriya tank has a capacity of 22,550 hectares and a relatively small catchment area of only 24,000 hectares, whereas the main source of water for the tank is the ancient Elahera canal, a diversion of River Amban, which is a tributary of Mahaweli Ganga. At the south-east corner of the park is Giritale Wewa, an ancient irrigation reservoir, too. The park is also part of Minneriya-Giritale Nature Reserve which was declared in four stages from 1988 to 1997. Minneriya was declared as a National Park in 1997 and opened for visitors in 1998. The topography is varied, with hills and grasslands of both types patanas and talawa, the former at slopes of hills, the latter as a result of chena cultivation in the plains. The tallest peak is Nilgala, with a height of 885 m.
The annual average rainfall in this central dry zone area is about 1500 mm, the wet season lasting during the north eastern monsoon from October to January. May to begin of October is the local dry season. Like in most dry-zone wildlife parks of Sri Lanka. the mean annual temperature is 27.5 degree centigrade. Common canopy species in the dry-mixed evergreen forest are Milla (Vitex Altissima), Palu (Manilkara Hexandra), Penela (Sapindus emarginatus), Koon (Schleichera oleosa). Burutha (Chloroxylon Swietenia), known as Satinwood, and Kaluwara (Diospyros ebenum), known as Ceylon Ebony, also occur. A typical scrubland tree is Maila (Bauhina racemosa). Among the larger shrub trees is Weera (Drypetes Sepiaria). Dense stands of bamboo occur in a few parts of Minneriya National Park, up to 15 m high Giant Thorney Bamboo (Bambusa bambos) being the dominant species, known as Katu-una in Sinhala. Grasslands interspersed with shrubs are common in areas of abandoned chena cultivation and and open grassland plains are found at the banks of Lake Minneriya. Guinea grass (Panicum maximum), known as Maana in Sinhala, is the dominant grass species. Cotton wool or Cogon grass (Imerata Cylindirca), called Illuk in Sinhala, also occurs. Plantations of eucalyptus and teak, established by the Department of Forest Conservation, can be seen within the park areae. The main threat to the park's forest are water pollution and clearance for firewood and the practice might be resulted in decreasing the levels of water of the reservoir. Spread of invasive Lantana camara is a natural threat. 24 specied of mammals are recorded in the national park and the adjacent Minneriya Giritale sanctuary, 3 of which are endemic to Sri Lanka among them the two endemic monkeys, Purple-faced Langur and Toque Macaque. Rare and endangered species such as sloth bear inhabit Minneriya. The estimated number of 20 leopards is not low, but the big cats are rarely sighted here. Minneriya is one of the areas where the very rare Gray slender loris (Loris lydekkerianus nordicus) is reportedly found. Other mammals inhabiting Minneriya are Spotted deer, Sambar deer, Wild buffalo, Wild boar, Golden jackal, Indian crested porcupine and Indian pangolin, and three species of mongoose. 25 reptile species occur in the park and the adjacent sanctuary. Among the 8 endemic reptile species are Common Supple Skink (Lankascincus fallax) and Painted-lipped lizard (Calotes ceylonensis), also known as Sri Lanka bloodsucker. 9 amphibian species occur in Minneriya National Park and Minneriya Giritale Sanctuary, 2 of which are endemic, one being Common Hour-glass Tree frog (Polypedates cruciger). Frogs and shrub frogs in particular are abundantly present. 160 species of birds have been recorded. Kingfishers and flycatchers are the visitors’ favourites. Flocks of 2000 Little cormorants (Microcarbo niger) have been reported. 6 bird species of Minneriya National Park are endemic to the island, namely Sri Lanka grey horn-bill (Ocyceros gingalensis), Sri Lanka green pigeon (Treron pompadora), Brown-capped babbler (Pellorneum fuscocapillus), Sri Lanka Scimitar Babbler (Pomatorhinus melanurus), Sri Lanka jungle fowl (Gallus lafayetii), Sri Lanka spurfowl (Galloperdix Bicalcarata). A globally endangered species inhabiting Minneriya is the stork Lesser adjutant (Leptoptilos javanicus). The number of threatened birds recorded from Minneriya national park is 11. The number of fish species is 26, including 4 endemics. Malabar Labeo (Labeo dussumieri), endemic to southern India’s Kerala state and Sri Lanka, was once a threatened species, but the populations have increased in the recent past due to ranching. Three species of fish occuring in Minneriya are endangered. Introduced Thilapia species are dominant. Minneriya National Park is most famous for its elephant population. The tank is an incredible place to observe wild elephants coming to bathe and drink and graze on the grasses particularly in the evening. Up to 700 wild elephants dwell within the Minneriya area during the dry season from May till October. Usually they live in separate small groups of females, whereas males are loners. However, in the dry season 100 to 200 of them, mainly females and their offspring but surprisingly many young adult males too, form a single temporary herd at Lake Minneriyain the late afternoon. This annual event peaks during the months of August and September, when occasionally up to 300 individuals can be seen at the tank. It’s actually the largest meeting of Asian elephants anywhere in the world. This phenomenon has been popularly dubbed “Sri Lanka Elephant Gathering”. Many individuals seem to live in this area permanently. However, during the dry season they are joined be migrating elephants from two different directions but mainly from the north. This is the northeastern corridor of the island, crossing the Habarana-Polonnaruwa mainroad between Kaudulla and Minneriya. It’s one of the three major migrating routes of Sri Lankan elephants. They come from the the jungle areas near Kantale 40 km north of Minneriya and the Somawathiya National Park in the northeast. Additionally, Minneriya attracts elephants from Angamedilla and Wasgamuwa national parks, which are located 20 km to the south. It is difficult to fully understand the habitat needs and social dynamics of an elephant population. However, seasonal elephant migration is a very common behaviour. Also Asian elephants in deciduous forests in India migrate between 20 and 50 km, compared to up to 100 km long migration treks of African elephants. Elephants in Africa and Asia alike generally follow the same migratory routes annually. Migrating, they often join individuals or family groups otherwise not belonging to their own herds. Several family groups of African elephants forming larger groups for migration are called bond groups. The Minneriya elephant gathering is not such a bond group, as in Sri Lanka the smaller herds migrate separately and only meet at the target place. During the dry season in north-central Sri Lanka, Minneriya offers both relatively dense forests that provide ample shelter for the elephants during the hot days and large quantities of grass in the plains at the reservoir feeding them. Although a fully grown elephant needs as much as 100 litres of water a day, water enough would still be available at the Kantale tank in the north and Mahaweli River in the northeast and Topa Wewa in the south, too. But during the dry season, the jungles of Minneriya National Park and the grassplains at the reservoir provide much more food than other regions. In fact, additional amounts of elephants’ favourite grass is then available at Minneriya, because when the water in the reservoir recedes it exposes very fresh green shoots of grass on the soil of the wet tank bed on which the elephants can graze. This is why the daily meetings take place at Minneriya tank. They also bath and play and nurse and socialize and even find mates on this occasion. When the anti-monsoon reaches Minneriya, typically in the month of October, the northern migrating elephants first move back to Kaudulla tank and to Hurulla Eco Park close to Habarana, where up to about 100 resp. 50 elephants then can be seen during the late afternoons, particularly begin of November. Finally, the elephants will retreat to the forests and be scattered in the jungle areas even farther away during the winter months. The exact timing of the migration depends on the seasonal conditions and can slightly differ from year to year. Local guides know where the greatest concentrations of elephants can be seen at any given time. Not surprisingly, tourists visit Minneriya National Park largely because of the elephants, especially the said elephant gathering in the local dry season, which coincides with the northern hemisphere summer holidays. To see the Elephant Gathering, you have to join a safari. After obtaining a permit from the wildlife conservation office, cay could enter the park with a park ranger. Jeeps with a driver can be organized at the park entrance. The main entrance to Minneriya National Park is situated 9 km to the east of Habarana junction, at the right side of the mainroad to Polonnaruwa (A11). However, many jeep safaris include pick-up and drop-off at the various hotels or guesthouses in Habarana or near Sigiriya. This is the most comfortable way to explore Minneriya National Park. The park is open from 6.00 a.m. till 6.30 p.m. Safaris should take place in the early morning or late afternoon hours. For enjoying the elephant gathering, late afternoon or evening safaris are more rewarding than morning safaris. Suggested times to start and end a Minneriya afternoon safari are 3.00 p.m. resp. 6.00 p.m.
On a Minneriya safari you will also see other animals, different species of monkeys and deer and a rich birdlife in particular. The main attraction however is the elephant gathering. The open habitat around the reservoir provides a perfect opportunity to make very good observations of wild elephants, getting an impression of their social behaviour. The recent popularity of the elephant gathering has increased safari tourist numbers of Minneriya National Park dramatically. This means, you not only see plenty of Asian elephants but a seasonal accumulation of tourists (a subspecies of Homo sapiens attracted from overseas), too. Particularly in August, Minneriya National Park is the setting of both an elephant gathering and a jeep gathering. This is to say: You should be aware that you will not observe wild elephants completely undisturbed. For those who already joined multi-day camping adventures in remote wildlife areas, the safari feeling in Minneriya in August will most probably turn out to be more like that in a theme park. However, the overwhelming experience of sighting such a huge amount of wild elephants and seeing them from comparitively close distance definitely remains to be a major attraction and an unforgettable experience. Particularly children will love the sighting of the gathering herd with quite a few elephant babies. Minnerya’s Elephant Gathering was ranked sixth amongst the world’s most magnificent wildlife spectacles by Lonely Planet. Despite the well-organized way of this tourist spectacle and though elephants are intelligent animals that are fully aware that visitors are gawking at them. you should not forget to be among wild beasts that are potentially dangerous. Guests are not allowed to get off the jeep and walk around. Furthermore, Minneriya is still a national park and not a place to feed any of the animals. You should avoid to disturb the protected animals, which could affect their behaviour. Keep distance to elephant babies in particular. And never push your driver to go closer for your selfie. Keeping respectful distance from the jumbos is a must for your own safety and for the benefit of the wildlife as well. Some years ago, Minneriya safaris earned a bad environmental reputation, because jeeps were driving too close to the elephants to satisfy the guests’ wishes. Travellers who intend to avoid the crowds, should consder a visit of the nearby Kaudulla National Park, where a smaller group of elephant gathers during the same period. Minneriya National Park has no accommodation facilities within its boundaries. But situated in the core of the Cultural Triangle region, the immediate surrounding of the park is a cluster of hotels and guesthouses. Habarana offers a range of comfortable hotels within only 10 km distance from the park entrance. Eco-Lodges can be found in the jungles between Habarana and Sigiriya. Guesthouses are available in Sigiriya in about 20 km distance from the main gate. The most famous eco-friendly luxury hotel of the Cultural Triangle, the renowned Kandalama Heritance, is in 40 km distance. All these places mentioned above belong to the Dambulla-Habarana area, which is located to the west southwest of Minneriya National Park. Accommodation is also available in the core areas of Polonnaruwa District to the east and southeast of the park. Minneriya Town 15 km east of the main gate, at the opposite side of Lake Minneriya, has plenty of guesthouses, whereas Giritale 6 km further south, between Minneriya town and Polonnaruwa, offers a good choice of 3-/4-star hotels and eco-lodges. Many guests of Mineriya National Park arrive from Polonnaruwa, which is in 36 km distance from the main gate. The ancient Sinhalese civilization is famous for its achievements in irrigation technology. Sri Lanka’s dry zone was probably more densely populated than contemporary agricultural zones in Western Europe. In the semi-arid area of Sri Lanka’s north-central plain this would never have been possible without an elaborate system of larger and smaller tanks interconnected by canals. 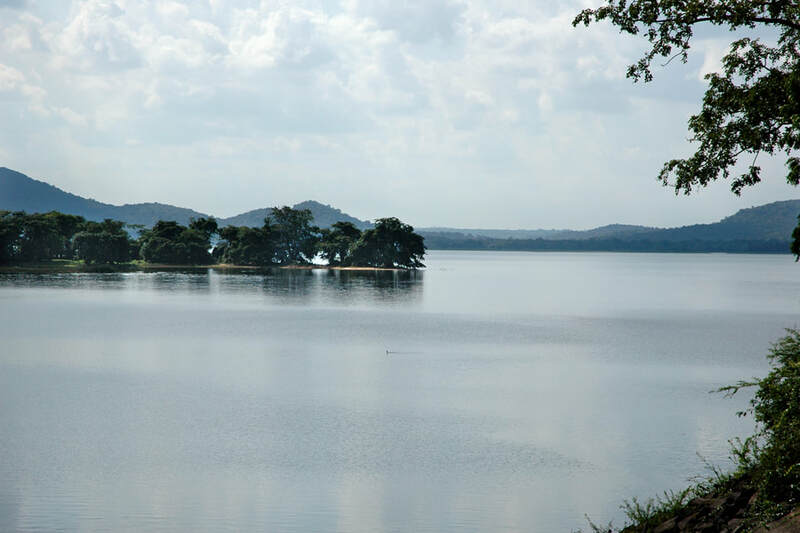 Minneriya Wewa is definetely one of the most significant ancient reservoirs of the island. When it was built in the late 3rd century A.D., it was Sri Lanka’s largest tank at that time, covering 19 square kilometers. The ancient dam, restored in the 19th century, is 2320 m long and more than a dozen meters tall. The ancient Minneriya project is historically outstanding for at least three more reasons. Firstly, although the Minneriya River also feds the tank, the main tributary of Minneriya Wewa is a man-made river. The main source of water is the Elahera canal, a diversion of Amban River, which otherwise is a tributary of Mahaweli Ganga, Sri Lanka’s largest River. The ancient anicut diverting water to the north is in 40 km distance from Lake Minneriya. Secondly, by tapping the Amban River, a completely new river system much further south and closer to the highlands was tapped. This means, that water ressources of the Anuradhapura kingdom increased significantly. 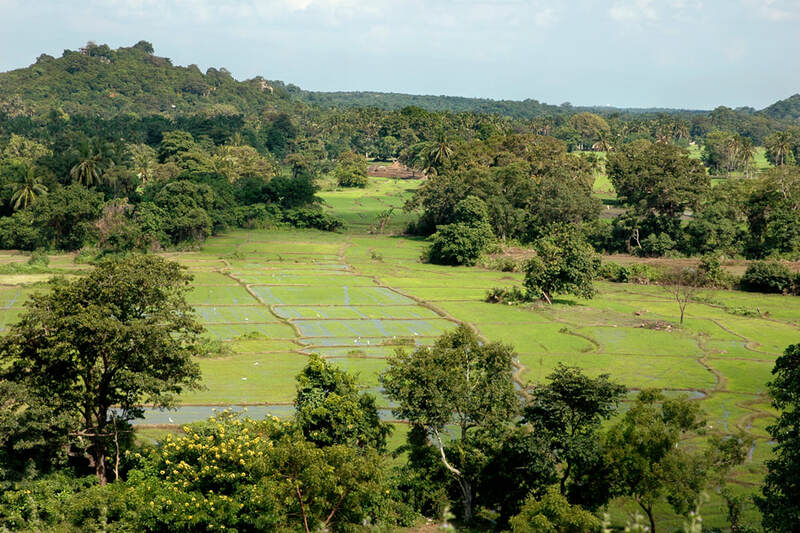 Previously, only the water from the catchment area of Malwattu Oya had been available for paddy cultivation of the most important Sinhalese kingdom. Now an additional source of water allowed developing new areas of cultivation. Thirdly, this new paddy area below the Minneriya reservoir dam was situated at the opposite side of Sri Lanka’s main watershed. This resulted in a massive expansion of the Anuradhapura civilisation to the east. Minneriya Wewa was the first major irrigation project in the Polonnaruwa area. Polonnaruwa previously had only been an army camp at the main ford of the Mahaweli river, which was the natural border between the Anuradhapura Kingdom and the Rohana prinicipalities in eastern and southern Sri Lanka. Starting with the Minneriya project, Polonnaruwa now became a second agricultural hotspot of the Sinhalese kingdom, after some time it was of equal importance as Anuradhapura. In a sense, Minneriya was an immense starting block for the the rise of Polonnaruwa, which became the Sinhalese capital 800 years later. Discussing the historical significance of Lake Minneriya may come to a surprise for modern travellers who learn about Minneriya National Park as a wildlife destination in the first place. However, the cultural and natural aspects are interrelated. Right from the beginning, reservoir projects were not only intended to serve for the benefit of peasants but also of wild animals. When the Buddhist missionary, Mahinda, arrived on the island, in his first sermon to the king he mentioned that a king is not the owner of the land, since a land must be owned by its inhabitants. This being remarkable enough, the inhabitants then named by Monk Mahinda explicitely are both human beings and animas. The wellbeing of all creatures, not only of human settlers, was a goal of the official ideology of Buddhist kingdoms in Sri Lanka from the founding period onwards. Accordingly, ancient reservoirs were intended to provide water for wild animals. This was in fact not a contraint of agricultural development, since paddy field irrigation was possible only downstream, below the dam. The opposite side of the reservoir, with its shallow ground and wide littoral zones, could serve for the benefit of the wildlife. This was the case already in antiquity and now Minneriya town is on the one side and the national park on the other side of Lake Minneriya. In many cases, the mere existence today’s wildlife zones in Sri Lanka’s dryzone – including the annual migratory movements of elephants - are side effects of human intervention in ancient times. The king responsible for the historically noteworthy construction of the Minneriya dam and reservoir is Mahasena. This is a remarkable king, indeed. Constructions of large reservoirs had begun already under King Vasabha in the 1st century A.D. who is also credited with building a predecessor of the Elahera canal. Later onm Dhatusena in the 5th and Parakramabahu in the 12th century are not second to Mahasena concerning the scale of their achievements. Nonetheless, Mahasena marks the beginning of a systematic approach, developing an entire network of canals and tanks in a cascade concept and covering diverse catchment areas. The ancient Mahavamsa chronicle attributes 16 vast dam consructions to King Mahasena, more than to any other king. Though not all of them are identifiable, Minneriya and neighbouring Kaudulla are definitely from Mahasena’s period. Although the chronicle concedes or must concede, that Mahasena’s dams are extraordinarily meritorious works, this remarkable king is an anti-hero in Sinhalese history. How can this be? The reason is: The chronicles were written by Theravada Buddhist monks from the island’s first monastery, the Mahavihara in Anuradhapura. But Mahavamsa was an opponent of this specific monastery, as he favoured Mahayana Buddhist monks and on their advice founded the new great Jetavanarama monastery on temple ground that belonged to the Mahavihara. Misappropriation of temple ground is a kind of sacrilege in Buddhism. 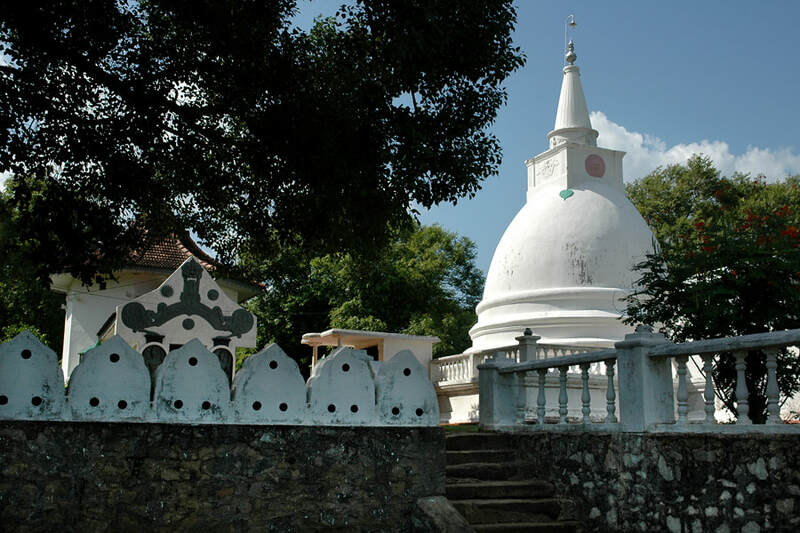 Not surprisingly, Mahasena is considered to be a heretic on the thrown of Anuradhapura. Nevertheless, Mahasena is held in high esteem by many Sinhalese and Tamil people till the present day, namely those living in the Minneriya area. They venerate the ancient Sinhalese king as a deity, the lord of the dam and the lake and the entire Minneriya region, who helps to provide fertility. 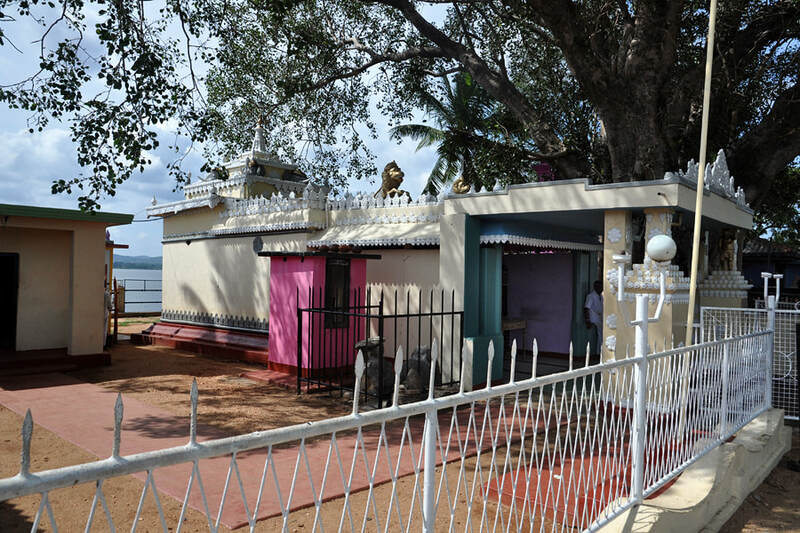 His temple can be found on the ancient dam of the Minneriya Wewa, the source of the richness of the region’s soils once built on the order of King Mahasena. His name is “Minneri Deviyo”, the “Minneriya God”. Puja ceremonies in Minneriya Wawe Devalaya are celebrated on Wednesdays and Satudays. A nearby Buddhist temple called Mahasen Vihara claims to have been founded by this king. After the 14th century, the Minneriya dam fell into disrepair. Already during the first years of British colonial rule, the British officer Ralf Bachaus stated that the entire area could be irrigated if this reservoir is restored. Henry Ward, British Governor from 1855 till 1860, recorded the beauty of the vegetation and wildlife in this area and reported, that this must have once been a much larger reservoir. 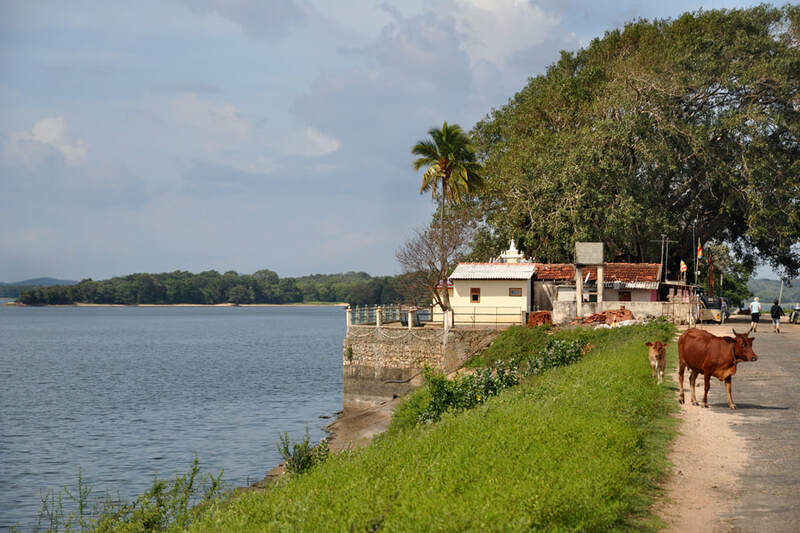 Inspired mainly by the ancient Minneriya dam, it was Governour Ward, who initiated the colonial period’s efforts to restore ancient tanks mainly in the region of what was once the Anuradhapura Kingdom and is now known as “Cultural Triangle”. In 1856, he issued the “Irrigation Ordinance”. Restoration works adminstered by the Irrigation Department were carried out at the Minneriya dam in 1903. After Ceylon’s independence, the capacitiy of Minneriya Wewa was enlarged again. See you next year in Minneriya National Park!